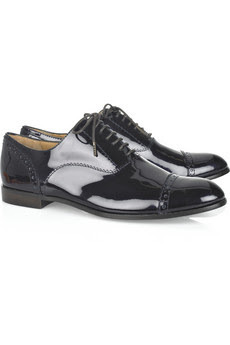 This season, the mannish brogue is in trend. 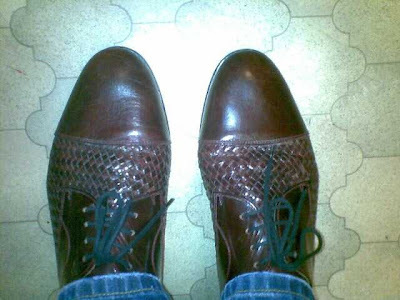 At the boot sale on Saturday I picked up these Russell & Bromley brown leather brogues for only £10. 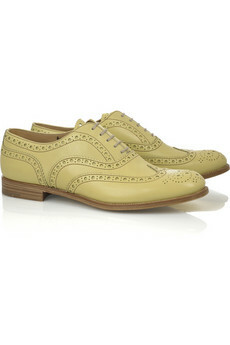 They are very comfy and the weaved detail makes them a bit different from the usual style of brogue. Will you be sporting brogues this season? Wow! I like yours the best by far. I think of all 3 yours are the best. What a great find! Ooooh! Yours are absolutely the nicest, love the weave detail. And as always, whata bargain! They are all exquiste - I like the first best - the colour and detail. Great find! I got mine from Topshop and they are great to wear but yours look the best! Excellent - you always find the best things! I liked heeled versions too!! I so love these shoes..dancing shoes..hahahha..well, I have a friend from New York City who always claimed these were the best to go clubbing in..so you could make a quick exit or a new dance move. These are way cool. Adorable brogues! Much more interesting and pretty (with the woven detail) than what's in shops these days. Great find!